Aspen Avionics’ open-architecture Connected Panel integrates certified avionics–in this case Aspen’s Evolution glass-cockpit displays–with mobile devices for pilots to make use of aviation apps. Aspen Avionics introduced its Connected Panel system at the EAA AirVenture Oshkosh show in late July and expects the first applications to be available to customers by year-end. Connected Panel integrates certified avionics, in this case Aspen’s Evolution PFD and MFD glass-cockpit displays, with mobile devices. The first applications will be for the iPad; Aspen is planning Android apps as well. Another factor in the utility of Connected Panel, Hayden added, is that it will allow older GPS navigators interfacing with Aspen Evolution displays to become touchscreen-capable. “We’re restricted only by a GPS’s ability to receive and transmit data through our displays,” he explained. “Now we can put a large-format touchscreen on your KLN 89,” added Lyons. The first Connected Panel system is Aspen’s Connected Pilot, and this includes the CG100 and will sell for $2,500. 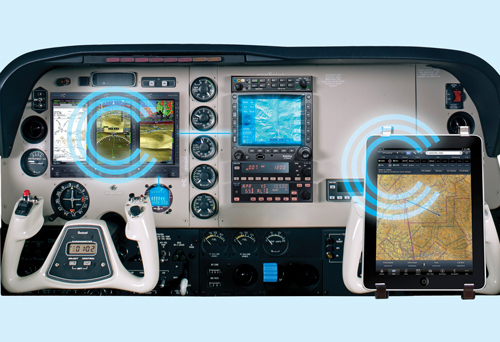 Connected Pilot works with the Bendix/King KSN 770 navcom/GPS navigator, which Aspen is helping to bring to market, and pilots will be able to use the Connected Panel iPad app to tune radios and crossfill flight plans from the iPad to the KSN 770. Connected Panel is designed as an open-architecture system, and Aspen has invited developers to create apps that will bring additional functionality to the system. But, for now at least, Connected Panel will work only with Aspen Avionics Evolution Pro displays and the KSN 770 (installed in an Aspen cockpit). ForeFlight is developing a Connected Panel app that will allow pilots to plan a flight on the iPad using ForeFlight Mobile then load that wirelessly into the KSN 770. Pilots will also be able to use the ForeFlight app to tune the KSN 770’s radios, by touching the iPad screen to push a frequency from a displayed chart to the standby window in the navcom. Another developer, AvConnect, will allow automatic logging of aircraft performance data and pilot hours into the AvConnect iPad app. Hilton Software is also planning Connected Panel capability for its WingX Pro 7 app. A big benefit of Connected Panel for iPad users is that GPS data from cockpit navigators can be delivered to the iPad easily, eliminating the need for an external GPS or relying on the iPad 3G’s internal GPS. More than a dozen companies are partnering with Aspen on Connected Panel apps or hardware, including avionics manufacturers Avidyne, Honeywell Bendix/King, J.P. Instruments and PS Engineering, and software and app developers AvConnect, Coradine Aviation Systems, Digital Sectional, ForeFlight, Hilton Software, iFlightPlanner.com, Jeppesen, Parrot, Pinnacle Aerospace, Seattle Avionics and Sporty’s Pilot Shop. “Once [developers] get the hang of Connected Panel, we will see lots of apps,” Hayden predicted. Avidyne says it is joining the Connected Panel partnership but it hasn’t yet revealed what kind of Connected Panel features it will offer on Avidyne avionics. More information will be forthcoming, but it’s probably safe to assume that flight plan upload to panel-mounted avionics is one of the features that will be offered. So far, no one is talking about porting weather from the iPad to panel-mounted avionics.